German philosopher, translator, specialist in cultural studies, and essayist. Chancellor of the University of Art and Design Karlsruhe, part of the Centre for Art and Media Karlsruhe. Student of Theodor Adorno and Max Horkheimer, continuator of the philosophical tradition of the Frankfurt School. He was also inspired by Friedrich Nietzsche’s thought. Described as the “new controversial philosopher of the mass media era”, one of the most influential European thinkers. His lecture entitled Rules of the Human Zoo, concerning the probability of using biotechnology to create a new “improved” human, delivered in 1999, went down in history as one of the greatest intellectual scandals of post-war Germany and began his dispute with Jürgen Habermas. His most important work is Critique of Cynical Reason from 1983 (published in Poland in 2008). His works published in Poland also include: Die Verachtung der Massen (2003), The Crystal Palace (2011), and Rage and Time (2011). 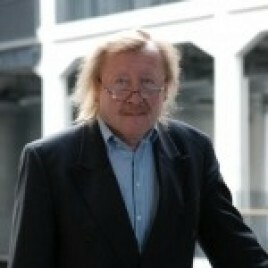 A meeting with Peter Sloterdijk will take place in Manggha on 21st October at 7:30.